This is Memorial Day week-end in the U.S.
That means that swimming pools will be opening for the summer. It means you can wear white again, until Labor Day - although that's now a somewhat out-dated fashion rule. It means that recipes for potato salad and marinades for the BBQ abound in newspapers and magazines. But one of my readers - and she will know who she is - reminded me of another thing that Memorial Day means. And that’s who we’re memorializing. ﻿ I have lived in France through times when it was hard to be an American without taking flak. The Vietnam days spring immediately to mind. And some of the Bush II years also. Other periods were far easier, for instance during Bill Clinton’s presidential terms, or when Michael Jackson brought out his Thriller album. Some visitors have complained about the non-welcome that Americans get in France, especially in Paris. (Of course, French people from the provinces also can get a rude welcome in Paris, but that’s another blog altogether.) 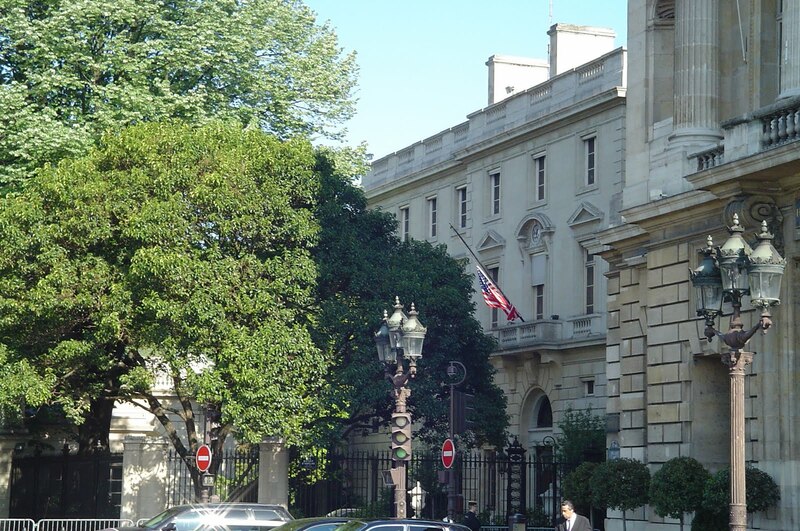 Not having an American accent in French, I’ve sometimes been privy to anti-American comments at dinner parties. That always makes my friends a bit nervous, so they explain to the offending party, "Sandy’s American, you know." An "oops" - in French translation - usually follows, with an apology. But this being Memorial Day week-end - and wanting to promote Franco-American friendship - I thought I’d tell you a story that happened to me while touring with some people through Normandy one year. At least you won’t be able to see when my eyes tear up, which they always do when I tell this story. ﻿ By the time of our tour, Mark was in his sixties and had returned to Normandy with four of his relatives. Usually a rather chatty guy, I watched him on Omaha Beach as we ate our picnic lunch. He stood off to the side - silent - watching a kid throw a stick into the water for his dog to fetch, and a couple walk hand in hand on the sand, and an old gentleman take his constitutional with the help of a cane. I went over to him. "Mark, are you all right?" I asked, struck by his uncharacteristic silence. Without turning, he murmured, "I never thought it could be like this again." After lunch, some of my flock wanted a coffee. I drove them along the crest of the bluff and we found a bar/café at a crossroads out in the middle of nowhere, among the fields. Inside, standing at the bar, were farmers in muddy rubber boots and faded blue work overalls, talking and having a beverage of their choice. We sat down at one of the tables, which were all empty. I took the order and went to give it in. The sixty-something year old gentleman behind the bar - probably the owner - took our order and brought it to our table. After a while, we were ready to get on with the day’s tour. We stopped at the bar to pay our bill. "How much do we owe you?" I asked the gentleman. "American?" he asked, looking us over in turn. "Yes," I answered, not knowing where this was going. "It’s already paid for," he continued. I looked around at the men standing at the bar, wondering why one of them had paid for us. "I was eight years old on D-Day," he went on. "It’s already been paid for." There is a cemetery overlooking Omaha Beach, on land which has been donated to America in perpetuity. 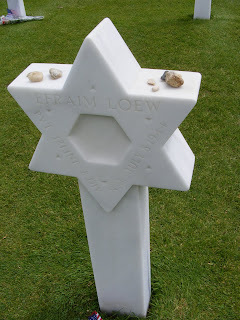 In it are buried 9,387 Americans who gave their lives to free Europe and the world of Nazi totalitarianism. My tourists always want to go there. I take them near closing time, when it’s more calm and most of the tourists have left. It’s most beautiful at that time, and you can hear your thoughts better. And the memories. All photos not marked otherwise are of the American Cemetery in Colleville-sur-Mer, Normandy. I was awake before the birds this morning... again. No particular reason. But when the sun came up, the birds started to sing. Especially the sparrows. They’ve got me pegged now, as a pigeon (pun intended). Especially one of them, who looks so small he (she?) must be from this year’s nest. He flutters down from the tree and hops around in front of my door until I notice him and feed him. He doesn’t like breadcrumbs but luckily I have some seed left over and he eats that. 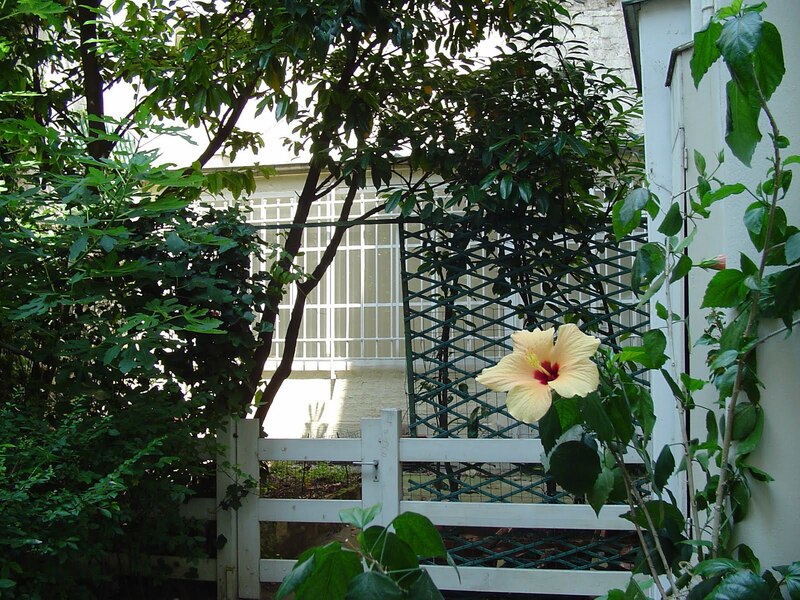 Then suddenly the merle chanteur (the Beatle’s "blackbird singing in the dead of night") scuttles in under my white fence - the border between my garden and the common courtyard - and heads for the sparrow. 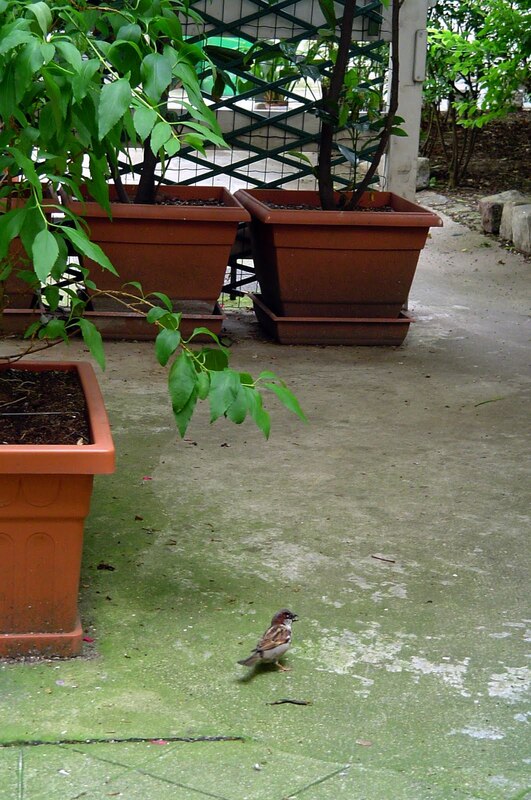 Usually a sparrow would fly off, being so much smaller, but mine doesn’t seem to mind. (Of course, he’s not afraid of me either.) So I lob some breadcrumbs over the sparrow’s head into the back court (it’s the French Open, remember?). The merle snatches up a beakful and flies off. In a few minutes, he’s back, so we run The Sequel and he flies off again. Then I’m out of bread, so I close the door and make myself some breakfast. A girl’s gotta eat, too. The drought continues in France. It’s wonderful to have these blue skies and nice warm temperatures in Paris: 57° min/70° max... a bit colder than Sunday and yesterday. But now 44 départements (out of 96) are suffering from drought conditions and water restrictions! There’s been absolutely not one drop of rain in Brittany for two months, which is three times less than normal. But so far farmers there have been allowed to irrigate their crops. That ends today. And even if it starts raining now, meteorologists say that won’t fill the water table because any rain that falls will be immediately soaked up by the plants, crops and trees. This hasn’t happened since 1976, and this year is expected to be even worse. The highlight of the day? Not buying the railroad tickets for the Loire tour, although they came out surprisingly cheap. No, it was the simili-pesto I made for my capellini at lunch. 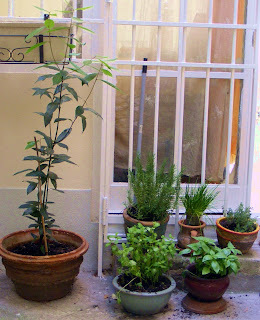 Remember how I bought all these herbs to plant and then took off for Provence? Well, orders were to water them, but hey... So some aren’t too happy, like the sage and the parsley... and the basil. I watered them all as soon as I got back, but to no avail. So today I decide to cut the fading half off and cut it up as small as I could and crush up some garlic to go with it. I have only parmesan, no asiago and no pine nuts - and more importantly no food processor or mortar and pestle to mush it together in - but I have some killer olive oil direct from the mill down near Aix-en-Provence. So I heat it all up a bit to infuse the basil and garlic into the oil a bit and... BINGO! Not half bad. There’s something to be said for being in the heart of Paris and cooking with your own herbs from your own garden. Well, I may have to begrudgingly thank all the yuppy BoBo (Bourgeois Bohemians) for this because, although they've ruined the neighborhood for the Common Mortal in other ways, their money has attracted good bread. I'm glad to finally be able once again to find the kind of bread you found everywhere when I arrived in Paris in 1968. During the time between then and now, no one wanted to work baker's hours so the kneading etc. was taken over either by North Africans, who are hard-working but didn't bake from the same recipe, or by central factories that sent dough out to local bakeries: white, tasteless stuff full of air that would go hard in a heartbeat. And the news gets even better: This is only one of my local options for a good baguette. There are two others. And each is different. Oh yes, I almost forgot: they also do specialty breads; again, each is different. 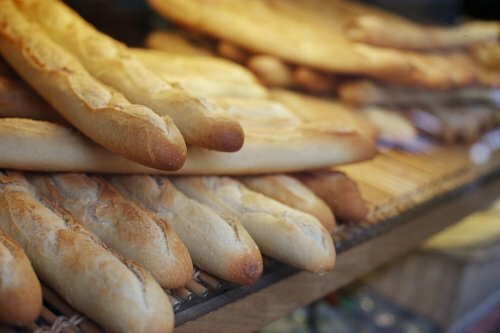 The best baguette in Paris 2011 – the winner! So, this year, Pascal Barillon from the boulangerie Au Levain d’Antan (here) was chosen from 174 contestants, of which 20% were instantly disqualified for having too much salt (max. 18g), being of incorrect length (baguettes must be between 55cm and 70cm) or not being the right weight (between 240g and 310g). I told you this was serious. And with 136 baguettes left in the running, competition was tough. I'm getting tired of doing other people's jobs. First of all, it takes away a job. Second, I'm not getting paid to do it, not even a discount for my services. Example: I'm old enough to remember when gas stations had a nice young man (who needed the money to buy a new pair of jeans) who would ask "Can I check the oil and water for you, ma'am?" Another example: postage meter machines that give you "stamps" for your letters. You have to know what kind of postage you need, and that's where people of a certain age sometimes start to get rattled. Many's the time I've helped someone through the Q&A period. Give me a good old open-air market any day! 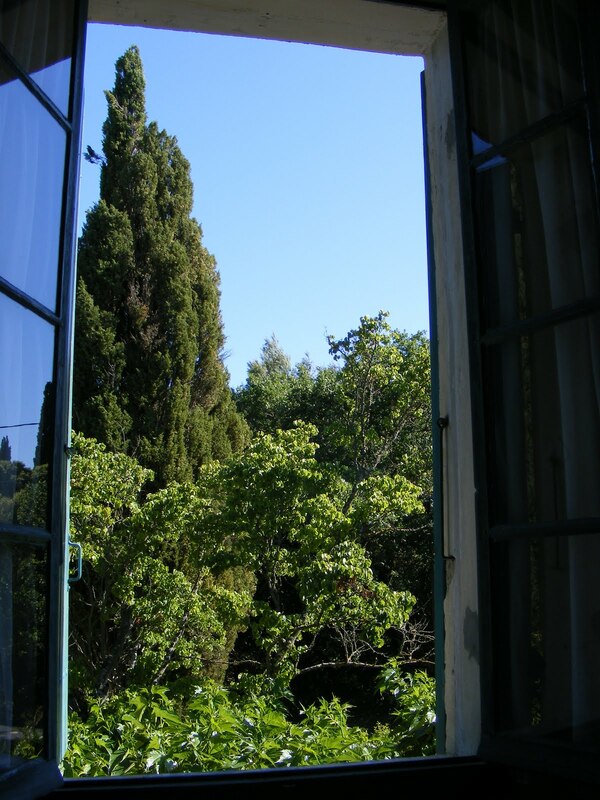 I’m sitting here in my room at a small hotel in southern France. The sky is cloudlessly and irrepressibly blue. The thermometer is well within the comfortable zone of the upper 70s (°F). The many climbing roses are beauteous in their dew-dropped colors. 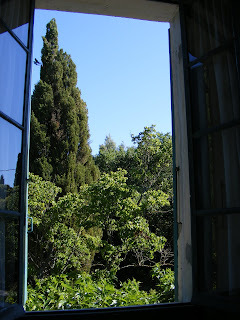 Birds are singing in the trees outside my window. And yet... It’s Friday. Tomorrow the world ends. Based on the deeds of my life, I’m probably not going to be one of the Raptured. Although, as I’m told God chose the 3% of humanity he wants to call home to him long ago at the Beginning of Time, maybe I was in His favor back then. Nowadays, not so much, I’ll bet. Too free-wheeling. Too inattentive to Scripture. Too absent from the pews of any church. But thankful every day for the beauty and bounty of Nature around me. Reveling in the sun and rain... and even the snow (for the first month, at least). Appreciative of the wondrous flavors and tastes of the foods and wines the good Lord saw fit to shower upon Mankind. By this time tomorrow (local time), I should be fixed on my Fate. If you don’t hear from me again, you’ll know I made the pick. Otherwise, I’ll just continue to post these ramblings about France. And if you haven’t been raptured, I hope you’ll enjoy them.